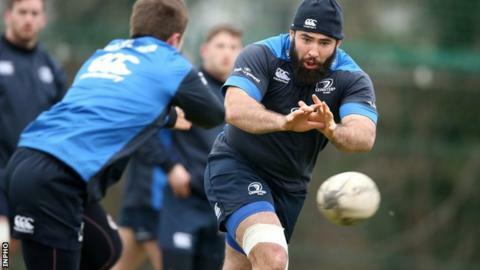 Irish prop Jamie Hagan will move to Super Rugby club the Melbourne Rebels after his short-term deal with Leinster ends after the World Cup. The 28-year-old tight-head prop signed with Leinster earlier this month for the duration of the World Cup, which finishes at the end of October. However, he will then move to the Melbourne Rebels on a two-year deal. "Growing up in Ireland, I have always watched Super Rugby and it has always fascinated me," said Hagan. "Now after eight years playing professionally in Ireland and England, I have an amazing opportunity to move to Melbourne and play both with and against people of such a high calibre. "It's such an exciting tournament; the rugby is fast, furious and open, everything that rugby should be." Former Munster coach Tony McGahan is currently in charge of the Rebels and he said Hagan would "bring experience to the squad". Hagan has had previous stints with Leinster, Connacht and London Irish and earned an Ireland cap against the United States in 2013. The Dubliner becomes only the second fully-capped Ireland international to sign for an Australian Super Rugby team, after front-rower Peter Clohessy spent the 1997 season with the Queensland Reds. The Rebels finished in third place in the Australian conference this season and missed the six-team play-offs.